Allan Cook has worked in a classified officer position in Department of Education secondary schools for more than 30 years and has been a union activist for more than 25 years. He will officially retire on the first day of the 2019 school year, precisely 40 years after he (nervously) walked into his first school as a science/maths teacher. Here he looks back at his long career and looks forward to what the PPCR might bring. It should go without saying, but nevertheless should be stated, that the role of the principal is an incredibly complex amalgam of long-term, thoughtful, strategic planning, critical decision-making at an operational level to promote and maintain the confidence of the school community, and collaborative, respectful working with the school community to foster positive relationships. This must all come together in providing opportunities for students to learn and achieve the best outcomes of which they are capable; as it has always. But I also believe that could similarly describe the role of many workers in schools, albeit with differing emphases and balance. The primacy of the classroom teacher, as a most fundamental and important influence in student learning, should be a significant factor in the ongoing work of a principal. Recent years have seen increased political calls for “professional autonomy” for schools, school leaders and teachers as “the” means to ensue improvements in school quality. Indeed, my observation is that some 20 years ago there was actually greater autonomy in schools than at present, which meant school teams had to make prudent decisions on issues and work toward their effective implementation. Invariably, on occasions, a poor decision would be made in that environment, which the system would work to remediate before promoting learning to ensure no repetition. The system has now become so risk averse that the work of the principal is increasingly filled with ensuring a range of administrative accountabilities are satisfied, each important, but collectively presenting a barrier to the instructional and professional leadership of the principal. The best form of professional autonomy will be that which supports school teams led by a principal making positive, evidence-based, collective decisions in the best interests of their students, but in the context of a policy framework that resources and recognises our commitment to a supportive and shared public education system. The Promotional Positions Classification Review is an important initiative that I have great faith will recognise the increased work value of school leaders. While the Union deserves credit for its initiation, both the Union and the department should be congratulated on the genuine and good faith manner in which they have participated in it. The release of the report late this year is greatly anticipated, for it has the potential to provide far greater recognition through remuneration of the complex work of school leaders and result in a long overdue revamp of the classification framework. In the early years of my promotional journey, it was implied I would need to choose between departmental progression and Union activism; how very wrong that implication was! 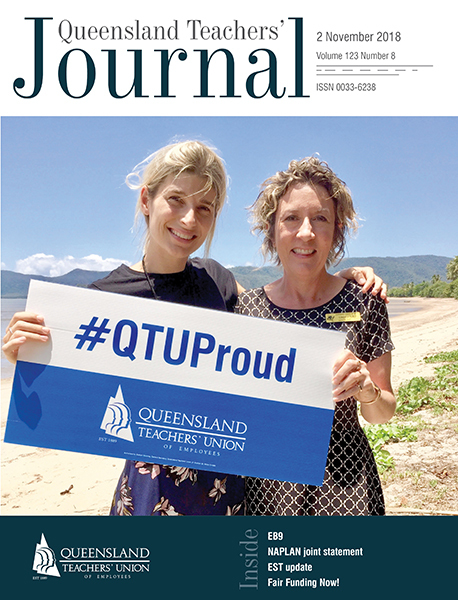 I have been proud to be a loyal and faithful servant of the public as a teacher and school leader, but also a committed teacher union activist at every level within the organisation. I believe that not only have the roles been complementary in nature, I have been a far more effective school leader because of my involvement, activism and influence with the union movement. Like many teachers and school leaders, I am appreciative that I have enjoyed a long and fortunate career; as one should expect it has not been without challenging and demanding times, but that is what makes it so the much more rewarding. It is (and has been for me) an honour and a privilege to work with colleagues, students and families. In our proud public education system, there will always be more challenges to overcome and more initiatives to implement in the best interests of students and our futures.